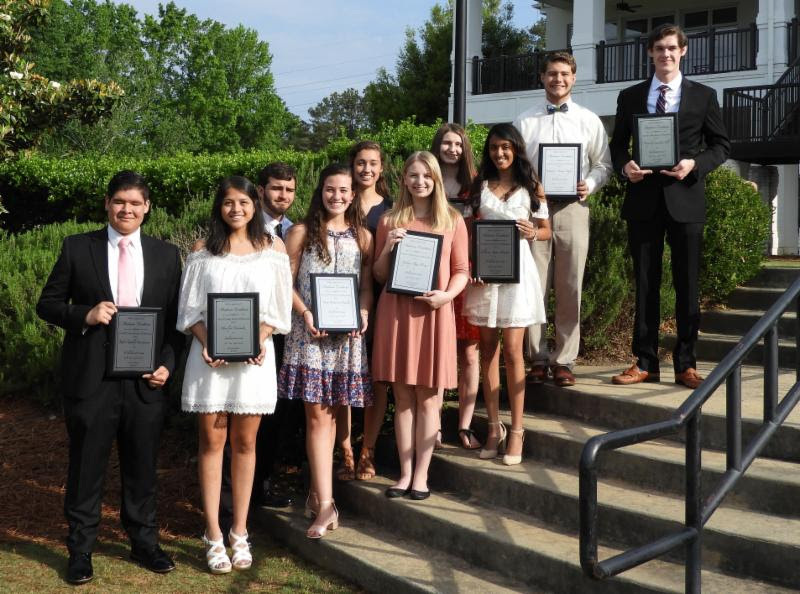 The Carroll County School System celebrated its 2018 Valedictorians and Salutatorians at a special recognition breakfast on May 15, 2018 at Sunset Hills Country Club. Keely Jones Greene, Project Manager for Children’s Healthcare of Atlanta and graduate of Central High School, was the keynote speaker. Mr. Bart Cater, Board Chairman, offered a moment of reflection and inspiration. Each student was presented with a plaque for their achievement by Scott K. Cowart, Superintendent and Mr. Cater. The event was sponsored by Roopville Road Baptist Church and West Georgia Technical College. Pictured Front Row (Left to Right): Ruben Rodolfo Rivadeneira –Villa Rica High School Valedictorian; Marilyn Bermudez — Mt. Zion High School Salutatorian; Anna Katherine Handley — Central High School Salutatorian; Sydney Rae Price — Temple High School Salutatorian; Olivia Agnes Basant — Temple High School Valedictorian. Back Row (Left to Right): Cade Nixon Barrow — Mt. Zion High School Valedictorian; Elise Marie Patrick — Bowdon High School Valedictorian; Kaitlyn Brooke Patterson –Central High School Valedictorian; Timothy Mason Duffie — Bowdon High School Salutatorian; Avery Christian Ross Hill — Villa Rica High School Salutatorian.